I am hoping it might fit a friend? made from my recent Outback Wife purchase. where they are now happily living on her guest bed! the intended recipient doesn't like it! I may add some other pastel colours? I am always beset with self doubt when sewing clothing, they usually turn out wearable, but often with a little flaw that I know is there. I usually pack my sewing up for a little while and do some other enjoyable activity till I feel in the right place to sew again. Don't let them get you down, you have had so many wonderful successes to celebrate too. We are human. All of us. We have ups and downs. Sucess. And failure. We often learn more about ourselves from our mistake. Celebrate the learning! That's life...and isn't it wonderful with all it's twists and turns. You are such an inspiration! I sure understand your feelings of "failure," but none of these are of YOUR making Don't feel bad for someone else's mistake or opinion... though I know how you feel about the latter, as I too have made something for someone else who didn't care for it. While it's easy for me to say, "Just set them aside and move on," I know it's not as simple to do. The dress you made from the barkcloth is beautiful! Wear it with pride and when someone compliments you on it, and they happen to be larger than you (! ), consider them as the prize-winner! 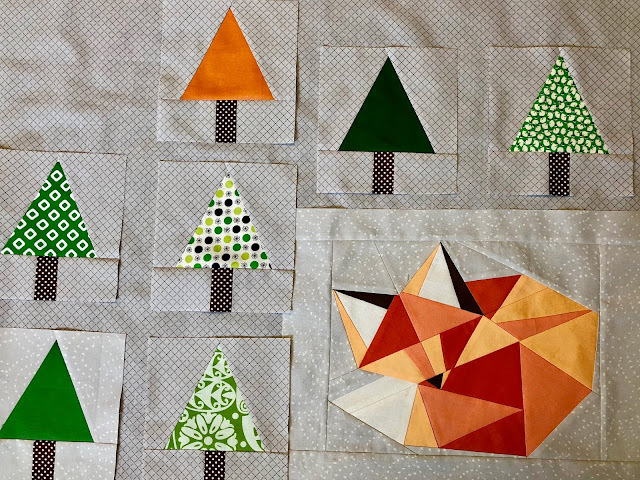 Same goes for that cute foxy quilt. The "right" person will come along. My example of that is the Building Blocks quilt I made two years ago. I made it because I liked it, and then stored it away it in the top of the closet. Now it graces the office of the Early Learning Center, and is perfect hanging there. Your quilt will be the same. Patience, Grasshopper. :-) Keep up the beautiful work! I used to sew garments all the time but suddenly couldn't get things to fit. So I haven't sewn garments in a while. I really like the print in the second dress. 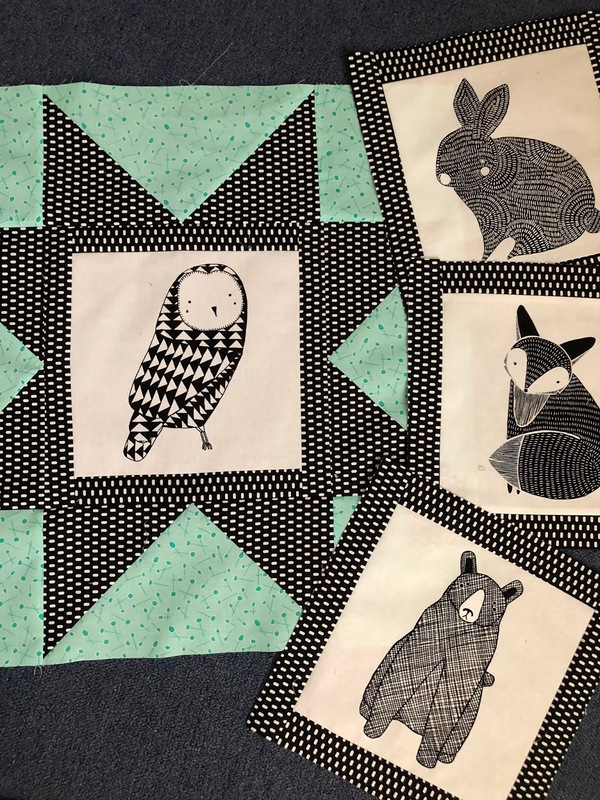 Green is my favorite color and the Outback Wife prints are all beautiful to me.As for the fox quilt - you will find a recipient who likes it! Sometimes we have to put projects back for a while so they get better with age. The pillows look great with the dresden quilt! I like the new attempt of wearables. The fabric is great. How could you not love the fox and trees??? Both dresses look lovely so it is real shame that the first one does not fit. I do hope you find someone for it. I think the trees look great in the Foxy Forest. Again, I hope there is another recipient who appreciates it a lot more. And I am really enjoying the last lot of blocks. Lots of possibilities there, especially with that pop of colour. Too bad the first dress didn't fit. Love that green print in the second one. Those pillows look great on the bed. Lucky sister! That foxy forrest is so charming. I'm sure it will end up loved by someone. I like the green with the black and white blocks. I wonder if too many other colors would be distracting. In my world, a dress that is TOO big is cause for happy dancing, as usually it's the other way around (too small). Sorry it didn't work out, but it does appear to be a dres that has lots and lots of ease built into it. Ah, that cute fox quilt--what a dilemma. I made a twin-size quilt for my son going off to college when he said he didn't really like it. So...it went into the UFO pile and I made him another one. I did eventually finish the first one, and my daughter claimed it for her family, so now it has a good home. 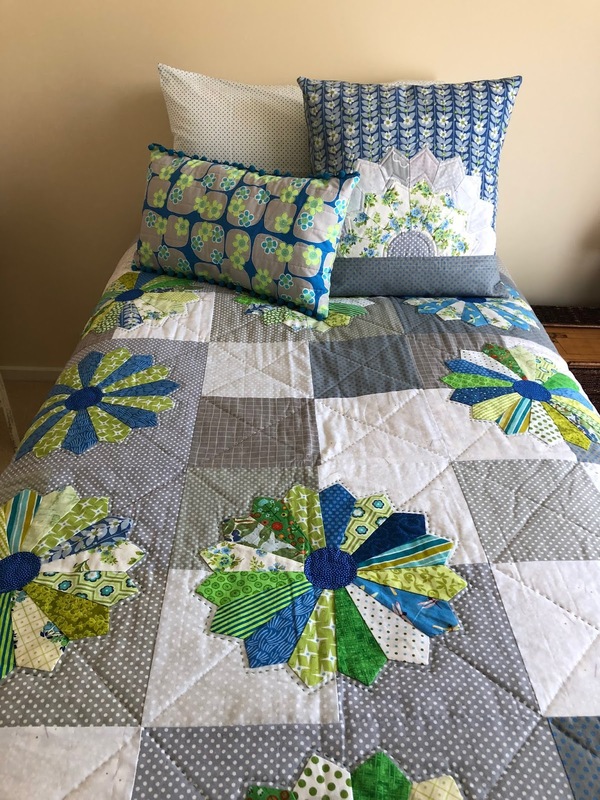 I love all your sewing: quilts and garments and pillows--thanks for the inspiration! What pattern is your first dress? 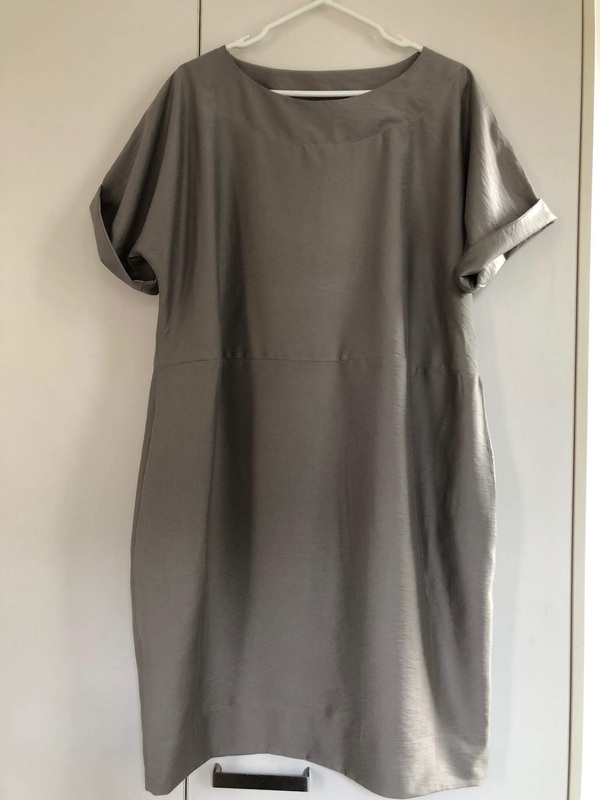 I like to make clothes and the whole right fabric-right-size-right fit is challenging. I tell myself I'm still learning and no-one was born knowing how do do this. Sometimes, if the outcome is disappointing, it helps! I guess I have so many other things in the wings that failures just get set aside and often never see the light of day again. Other times inspiration hits later that makes all the difference. 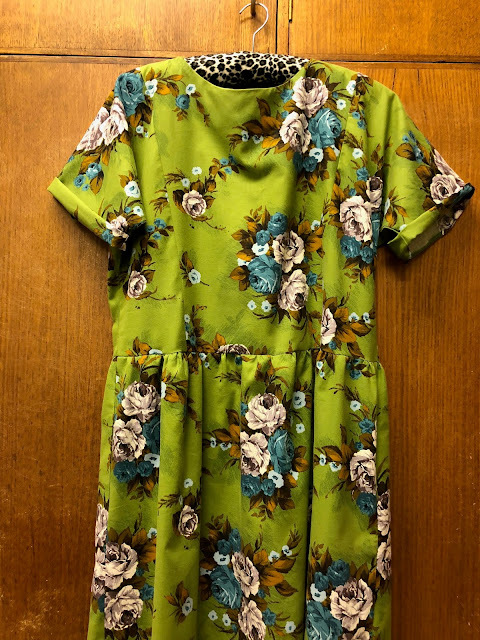 You have so many pretty things in this post even if the first dress didn't work. The Outback dress is just lovely. I don't sew garments at all anymore . . . not that I was ever any good at it in the first place. Quilts are so much easier since they don't need to fit. Have fun with those pretty AMH fabrics. They will make a gorgeous quilt.